Tenterden is a town with a large conservation area in the Ashford District of Kent. It stands on the edge of the remnant forest The Weald, overlooking the valley of the River Rother. It was a member of the Cinque Ports Confederation. Its riverside today is not navigable to large vessels and its status as a wool manufacturing centre has been lost. Jess, the owner of this quaint little retro themed tea room just on the edge of the town of Tenterden, lives on-site with her parents and uses the family's kitchen to cook the freshly prepare food for the tea room. I had the great pleasure to meet the owner, her father Richard and a staff member, when I entered this tea room late on a Wednesday and was the only customer present, as it was near time to close. I thoroughly enjoyed a cheese scone and two pots tea. I must say, I never thought I would find another cheese scone to rival that of Miss Mollett's High Class Tea Room in Appledore, but I have. It was delicious and went down a treat. I did consider buying some to take-away, but I decided not to; my weekly scone intake is at risk of being too high at times. This tea room originally opened in 2009 and closed for a time in 2014. I was alerted to this tea room for some years and every time I tried to visit, it was either too busy, had a private booking or was closed. However, Jess informs me that the tea room is now open for good, so I look forward to returning sometime in the near future. 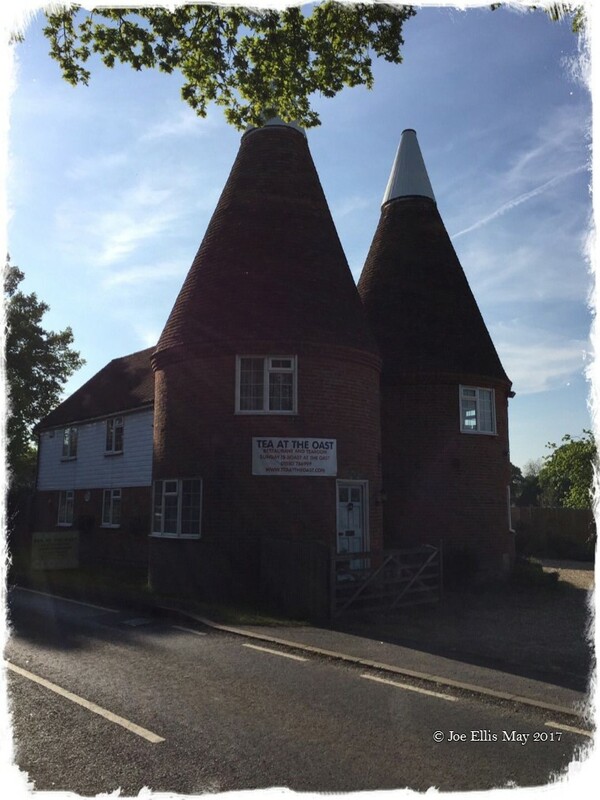 The tea room offers breakfast, lunches, afternoon teas and has a very poplar Roast and Dinner at the Oast. Advised to book, if you wish to take a Roast or Dinner, as it is, I am told, very popular. Jess also brought a vintage 1974 Bedford Ice Cream Van which is used in the summer and also available for private functions and photoshoots which is all mismatched, just like the tea room, and quirky which surely does give a unique experience. I found Jess and her father to be extremely nice and pleasant people. In fact, I had invited Richard to join me for a complimentary afternoon tea, but he respectfully declined. I have a strong suspicion that we would get on like a house on fire. Lots of free on-site parking, beautiful scenery, great atmosphere. I can recommend this tea room and can't wait to return very soon. 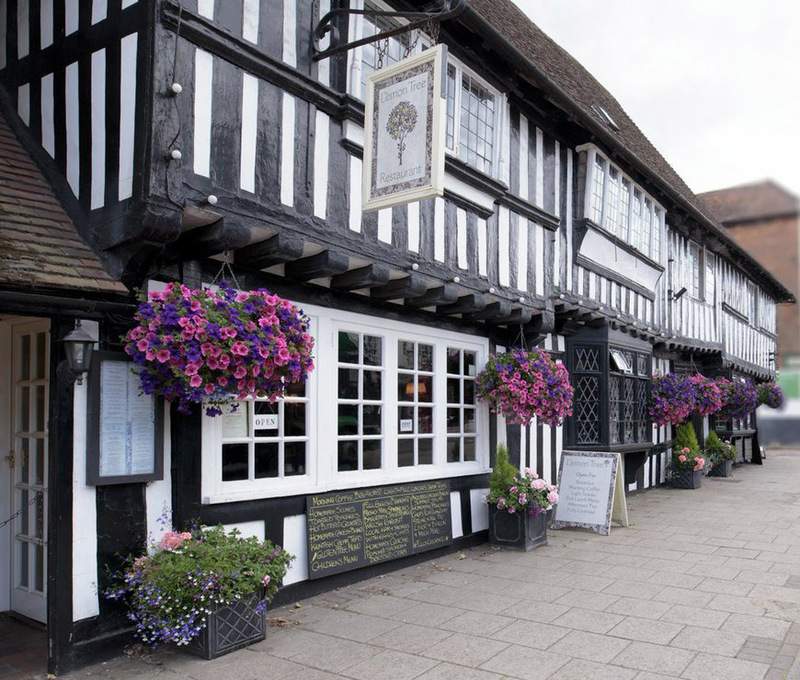 Set in a 14th century timber framed Wealden Hall House, the Lemon Tree offers a traditional Tea Room and Restaurant. Cakes and pastries are home made, scones are freshly made each morning and are served with award winning strawberry preserve. Many years ago, the Lemon Tree Tea Room was on the other side of the road next to the National Westminster Bank and they moved to its present location. It has extended seats, what appears to be through a series of three rooms or three former buildings. It can be very busy and I have visited to tea room on many occasions. I had one bad experience early summer, when I made my way through the main door and I asked whether I could sit at a particular table and the waitress said I could. I was then ignored and never able to order and I left some fifteen minutes later and ended in the Café Rouge restaurant a few doors down, which although was very nice, I missed the atmosphere of an English tea room. I did give the Lemon Tree another chance and returned recently. I ordered salmon fish cakes, French fries and salad and was offered a selection of bread in a basket that was so tasty, I asked for more! Of course, all helped down by a pot of tea. The fish cakes were so tasty, you will find it hard to find anything like them. I had fish cakes in the Café Rouge and although very nice, were not a patch on the Lemon Tree's version. There are actually lots of staff or waitresses at the Lemon Tree Tea Room so there should be no chance of being missed. Especially me, as I am a six footer and 16.5 stones in weight! Although the young waitresses are not rude, they are a bit too business-like and I think that a more gentle approach would be nice. Although the elder waitresses were much more pleasant. They need to keep up their standards, which are high as they are competing against other tea rooms in Tenderden who are only minutes walk from each other. I can personally recommend the Lemon Tree Tea Room - avoid lunch times, as the place is generally packed and you could end up queuing for long periods. Peggoty's Tea Shoppe had always been one of my favourites and when I had a karate class at the Tenterden Leisure Centre on Thursday afternoons for several years, Peggoty's was always the first stop before my class, although it played on me for some time afterwards...! 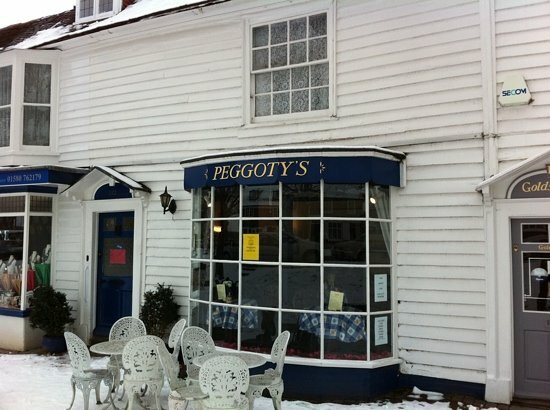 I have visited Peggoty's for years now, albeit owned by several owners, and as you are aware, Tenterden is my favourite Kentish town and full of English tea rooms. Peggoty's serves probably the best afternoon cream teas that I have ever seen, freshly baked on the premises. For little money, you get a full cream tea; fruit and plain scones the size of saucers and Sandra can never eat both and wraps one up and takes it home. The Welsh Rarebit is something a little special. I like to sit on the two seat table next to the window and looking and watching passers-by. Sadly, the original window glass which showed a tradition building has had to be replaced due to health and safety issues. In the heat of summer, I sit outside and have lunch and a pot of tea. It is very expensive for me to sit outside, as I invite elderly passers-by to join me for tea and cakes and a chat and gossip. Can't beat good old gossip with local folk, but I do meet new people and I enjoy it! Although Tenderden is full of tea rooms, Peggoty's is really popular and busy and the food and service is really nice and the atmosphere really nice. Some time back, the previous owner even gave me two Peggoty's mugs and they are Sandra's favourites. I can fully recommend Peggoty's tea room - go and try those lovely scone, I know you won't be disappointed and it is waitress service! I have walked past this establishment for some years on my way to other tea rooms locally, but as there was a car parking space available a late afternoon, I parked up and took my wife Sandra for a quick visit, just before closing time. Despite our late arrival, we received a very polite and warm welcome by staff. I had a tea and fruit scone, by wife a latte and a cheese scone. We sat and enjoyed this lovely place, clean, tidy, airy and spacious. A modern feel. The owners, Margaret and Ian took over in 2013 and have put their own style to the inside. 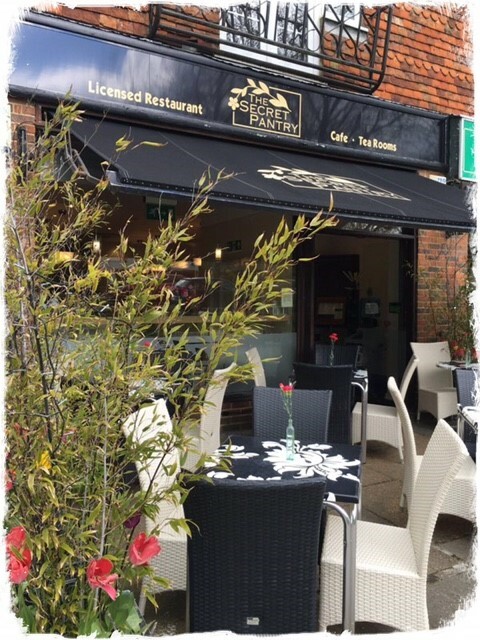 It is always busy inside and out when I pass the front on my frequent visits to Tenterden, a testament I feel to a poplar place for customers to visit. Afternoon teas are one of their specialities, with freshly baked cakes and scones and delicious finger sandwiches with a choice of fillings. They have also sourced some delicious teas, all their teas are tea leaves, giving a more intense flavour. I can recommend The Secret Pantry. But parking can be tricky; best park slightly out from the town centre and take a pleasant walk. The locals are friendly and little English shops make for a great day out.